First of all, I would like to use change of signs method to find the roots of the function y=x³+3x²–3. The change of sign here tells us that there is a root in the interval [0.8, 0.9]. The change of sign here tells us that there is a root in the interval [0.87, 0.88]. The change of sign here tells us that there is a root in the interval [0.879, 0.880]. The change of sign here tells us that there is a root in the interval [0.8793, 0.8794]. We now are using the Newton Raphson and Autograph to find the other two roots. From the table below, I can find out that the root in the interval of [-1, 0] is near to 0-3.5269 of 5 significant figures. On the other hand, from the table below, I can find out that the root in the interval of [0, 1] is near to –0.19609 of 5 significant figures. At first, let’s start with a close approximation, let X1= -3, on the x-axis (shown on the graph above), draw a verticle line until it meet y=0.5x³+1.5x²–x–0.25. When the line met the curve, a tangent is drawn and extended until it meets the x-axis and there is a new point on the x-axis, called X2, which is equal to -3.7858. From X2, draw a vertical line until it meet the curve y=f(x). When the line met the curve, a tangent is drawn and extended until it meets the x-axis and it is a new point on the x-axis, called X3, which is equal to -3.5566. 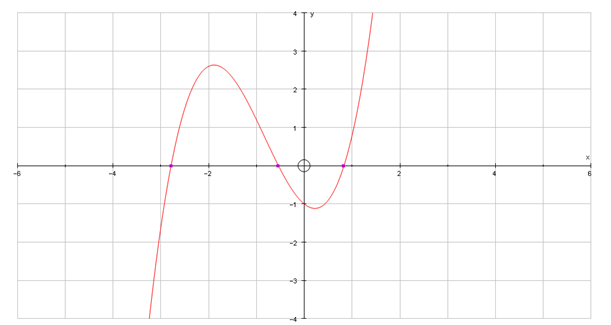 From X3, draw a vertical line until it meet the curve y=f(x). When the line met the curve, a tangent is drawn and extended until it meets the x-axis and it is a new point on the x-axis, called X4, which is equal to -3.5273. This procedure is repeated and the points generated on the x axis get nearer and nearer to the root. 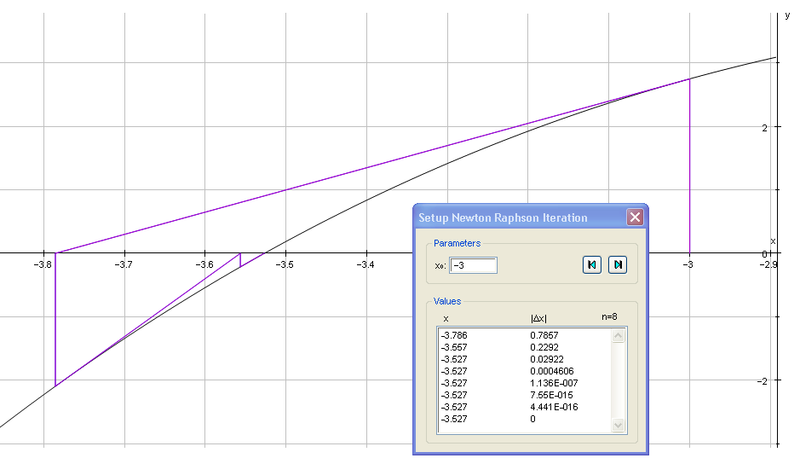 At last, I can see that Newton Raphson converges to a value near to -3.5269. I can see that all values in the range (-3.52685, -3.52695) round to -3.5269. Therefore, I can say that the root is -3.5269to 5 sig.figs. 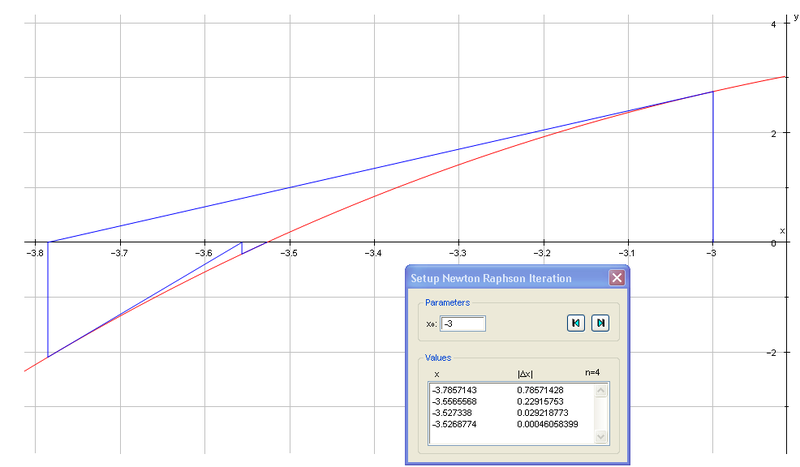 Newton Raphson method does not work everytime. Newton Raphson method will fail when I consider operating the process on the function f(x) = x1/3, start with the initial value x=-3. As you can see, from the start point of -3, the values of Xn become further and further away from the root between -3.52695 and -3.52685. This is because of the steep gradient where the graph crosses the x-axis, meaning that the resulting tangent is directed further away from the root. I am now using the example y=0.8x³+2x²–x–1 to illustrate the method of x=g(x). Illustrating the convergence using x = g(x) by using Autograph. First of all, we can see that the root is near -1, so start at a point x1 , which is -1, on the x axis line and draw a line vertically downwards to meet the curve y=f(x). When the line meets the curve y= f(x), a horizontal line is drawn to meet the line y= x. 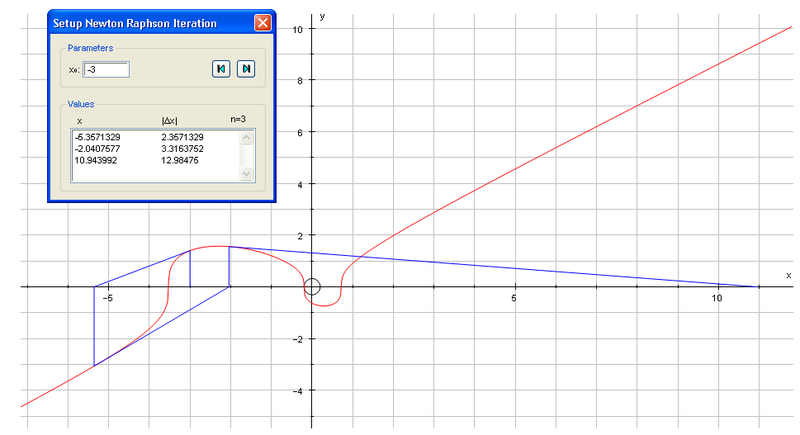 From x2, we draw a line vertically downwards until it meet the curve y= f(x) again. And a horizontal line is drawn and meet the straight line y=x. Since 0<g’(x)< 1 we expect to get staircase convergence and it is a success staircase and the result is the same as the expectations. Nevertheless, if we cannot see there is going to be a clear change of signs, Newton Raphson method would probably the quickest method among three of them, though it may be a bit complicated. All these methods can be carrying out simply by using the spreadsheet such as Excel. But among the three methods, I think change of signs method should be chosen as the easiest and quickest one. There isn’t any iteration and rearrangement involved in the formulae and it is very easy to enter all the information into Excel. Whereas we need to rearrange the formulae for Newton Raphson method and x=g(x) method, which we may enter the wrong figure into Excel by mistake and it is really complicated. Obviously, we can find the roots in no time by using Autograph. 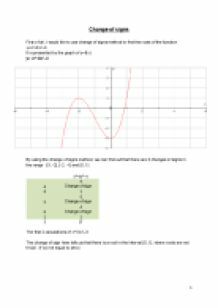 For change of signs method, we simply draw a graph by using Autograph and find the roots when f(x) = 0. It’s very easy for us to use autograph and it just involves one step. 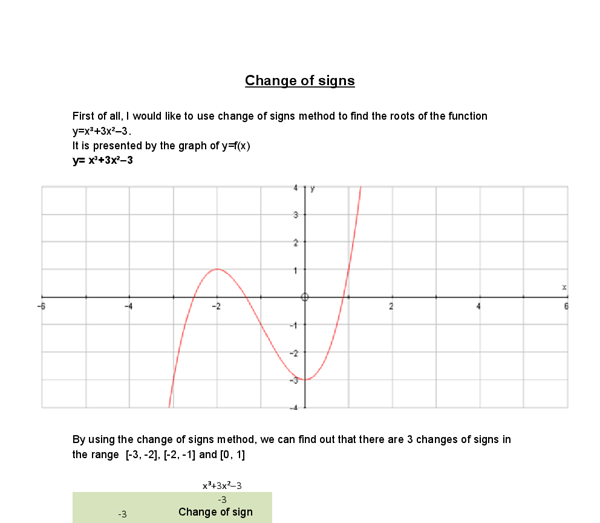 After finding the roots, we can leave Autograph and use Excel to proof the rest of the change of signs method. For other two methods, we need to do more steps. For example, we need to set up another equation y=x in x=g(x) so that we can continue to do the rest of the x=g(x) method. formula. This method is slightly complex even on easy formulas, but when we get really complicated when harder formulas are introduced. This is the hardest bit of the method as the iteration part is really simple, especially with the use of automated software/computer. 0.000 0.9962 sigma 8845.94 RSS 4.14728156e+009 R^2 0.99624 F(1,53) = 1.404e+004 [0.000]** log-likelihood -576.847 DW 0.498 no.of observations 55 no.of parameters 2 mean(C) 339918 var(C) 2.00545e+010 C = + 1.37e+004 + 0.9207*Y (SE) (3e+003) (0.00777) Figure1 Table 2 EQ (2) Modelling LC by OLS (using project12min.xls) The estimation sample is: 1948 to 2002 Coefficient Std.Error t-value t-prob Part.R^2 Constant 0.750412 0.09542 7.86 0.000 0.5385 LY 0.938329 0.007520 125. To check this is correct, substitute x = -0.9165 into f(x) = -0.00389006712 x = -0.9175 into f(x) =0.00125526563 The above calculations illustrate that there is a change of sign and therefore the root is -0.917� 0.0005. Fixed Point Iteration Method The equation has already been solved to find the root that lies in the interval [-1,0] using this method. and direction Sin ? = opposite Hypotenuse Sin ? = 30 340 Sin ? = 0.088 ? = Sin - 0.088 = 5.06o In this case the pilot will have to fly on a bearing of 180o slightly southeast to arrive back at base camp. 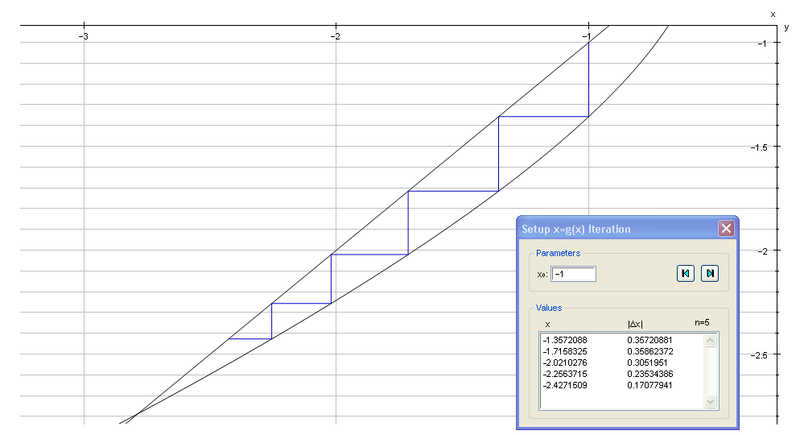 * There is a connection between the Trapezium Rule and the Midpoint Rule which can be used to shorten calculations: * Quick calculation of using and * All three rules simplify the working out on the spreadsheet due to less difficult formulae Formula Application I used the programme "Microsoft Excel 2003" to produce the spreadsheet. 0,680760 -0,000056 0.67 -0,06939 0,687 0,040909 0,6807 -0,00045 0,680770 0,000010 0.68 -0,00501 0,688 0,047526 0,6808 0,000205 0,680780 0,000075 0.69 0,060803 0,689 0,054157 0,6809 0,000857 0,680790 0,000140 0.7 0,12807 0,69 0,060803 0,681 0,00151 0,680800 0,000205 I can express this interval using the Error bounds.